KINESIOLOGY turns from a subjective practice into a SCIENCE - communicable to scientists / those who appropriately define measurement as different than intuition (replicable and therefore shareable!). This does not lessen the value of intuition - but increases it by confirming it. Coherence is a measure of which waves can be shared (which can radiate without interference)- literally PURE INTENTION and cellular intelligence! The strength of the muscle you test for cellular intelligence in KINESIOLOGY - is directly equal to the COHERENCE of the electrical signal your body (nerves) DELIVER to that muscle. 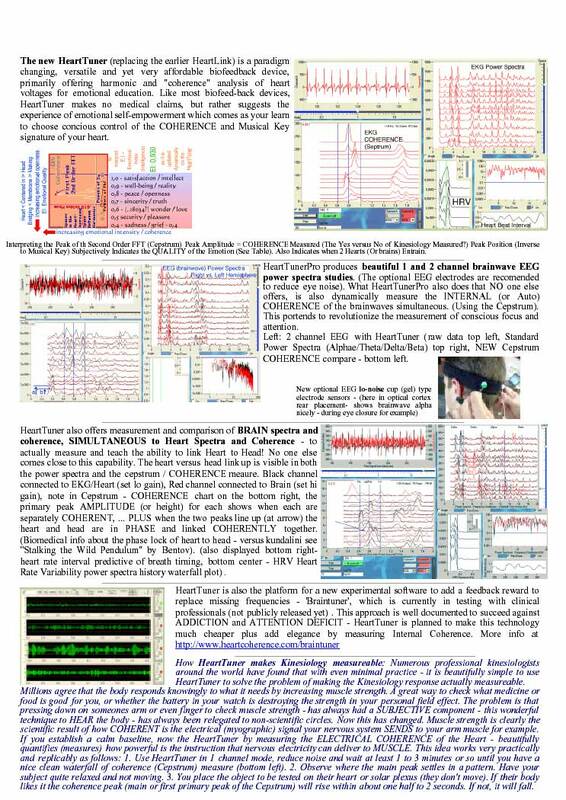 Since the EKG (heart) is the strongest source of the bodies electric - therefore it is perfectly logical that measuring HEART COHERENCE - (for the first time ) makes the KINESIOLOGY response measureable! What is more - as many kinesiology schools have already confirmed - this is true using the HEART TUNER in PRACTICE - as well as true in theory! using Heart Tuner to confirm the subjectivity of the Kinesiology response - for the first time with an OBJECTIVE measure! Suggesting The HeartLink Coherence Peak goes up when the touch point is correct, and then down to indicate when to remove the pressure. 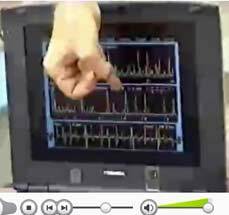 1.first measures the bodies yes / no - lie detector of COHERENCE - by measuring the amplitude of the cepstrum mathematic. 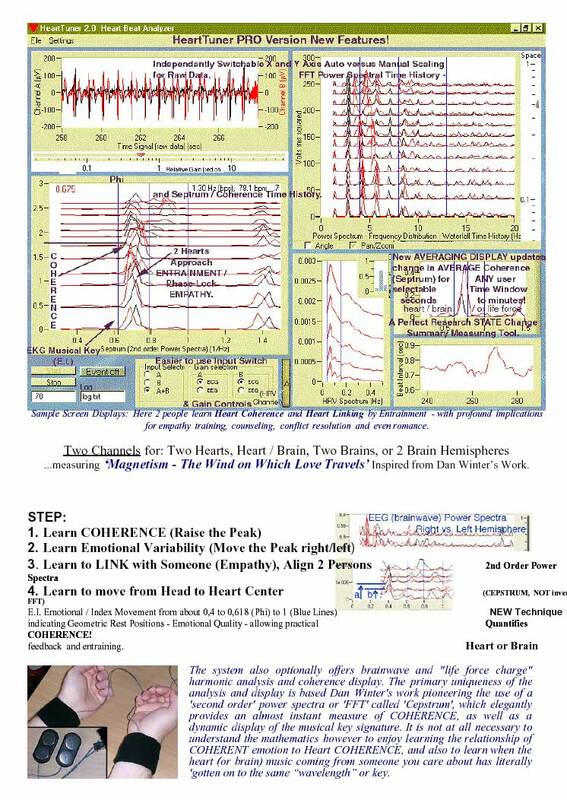 3. third measures ability for 2 persons to acheive heart link up (phase lock ) the true physics which preceeds real HEALING (charge transfer begins with impedance matching and phase locking for resonance transfer). This is the science made measureable of a) tantra , b) healing by touch , c) corporate concensus process, & d) conflict resolution - the BIOLOGY of peacemaking. 4. fourth - measures the ability to move from conceptual - 'head centered' emotions (where barriers are up emotionally - E.I. 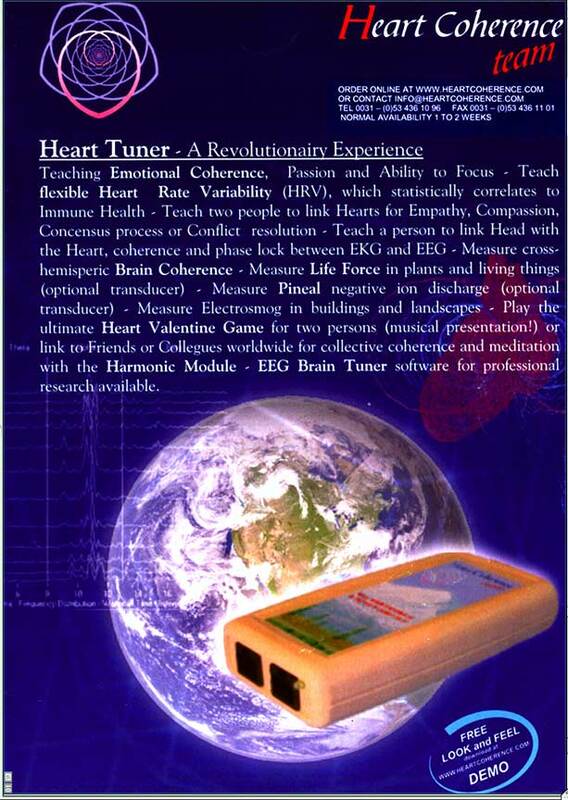 value on Heart Tuner = 1.0 ) to HEART CENTERED or EMPATHIC emotion ( E.I. value = .618 , ~Golden Ratio / touch permissive / barriers let down). 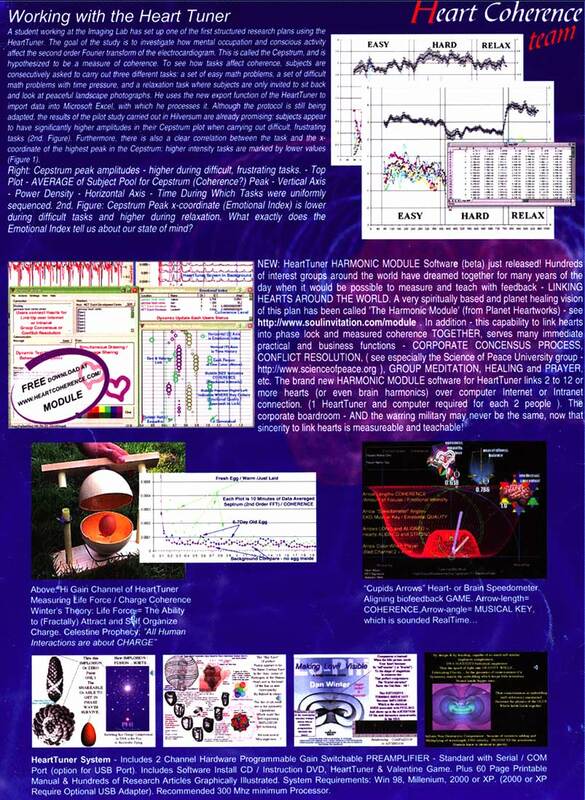 See measuring Heart's healing CANCER. that is the BEGINNING of successful body communication. This is in addition to the information described above about amount of coherence = measured muscle strength. Training in heart link up measured bodily empathy should be pre-requisite to successful KINESIOLOGY students - because it is so easy and effective to learn. (the feedback & measurement is fast and simple and dramatic).